Susan runs a successful business consulting company. She shared that while her top-line revenue has grown by almost fifty percent over the past two years, her net revenue or profit has grown less than ten percent. I asked Susan why her new business was less profitable than the prior business. Susan said “My clients keep pressuring us on price. We have to stay competitive, so even though we are doing more business, our margins are slim. I don’t’ know how long we can keep this up?” Susan overlooked an important lesson about when price matters most. When I work with individual companies to improve their margins, each and every one of those engagements starts with someone emphatically telling me that their “Clients are different. They really only care about price.” After seeing results, my clients realize that most of the perception about price is borne by the SELLER, not the BUYER. There are three specific steps you can take to ensure that you and your client appreciate value more than price. I’m not suggesting that these steps are trivial or easy. I am, however, suggesting that if you adhere to these principles, that you’ll improve your ability to deliver results for your customers at an improved profit margin. Consider this situation, a patient says, “Doctor, my arm hurts when I move it like this. What should I do?” The doctor responds “Don’t move your arm like that.” I don’t mean for this to sound like the joke. What I mean is that often, the person doing the selling starts the conversation with their client about price without even realizing it. You might say “Where are you getting that service today? We might be able to save you some money.” And in that very moment, you just taught your customer that price matters most. What if instead you had simply said “Some of our clients have told us they have realized much better results with our approach. Is that worth discussing?” In this case you focus on results and value, not price. You might think that you provide the same stuff as your competitors. If your business involves human beings, you are not a commodity. The buyer may want you to think of yourself as a commodity, but unless you are simply delivering the same people (as sometimes happens with government contractors), then you are different. More important than having marketing material that says you are different, you and your colleagues need to believe in what makes your company’s products and services different. Then you can focus your efforts where that differentiation matters most. Your unique attributes often pertain to your experience rather than the general services. So, though your Information Technology (IT) services, as an example, may appear to be similar to your competitor, you might have extensive experience with law firms and accounting firms. You’ll speak their language… and that’s worth something. When speaking with your client about the issue they hope to solve, recognize that the “issue” is the tip of the iceberg. In our research we know that customers make buying decisions when they appreciate “What problem you solve and why they need what you offer.” While discussing their issue (for example, hiring a new IT provider) might uncover WHAT problem they are trying to solve, we don’t yet know “WHY they need it.” To uncover the magic of WHY they need it, you ask questions like “What happens if six months from now you still haven’t solved this?” If they cannot convince you that this Issue has enough Impact associated with not solving the Issue, then it might not be worth your time to pursue the opportunity. If you are more passionate about solving the issue than your client, bring your wallet… you’ll have to pay for it. Susan and her team now make a practice of implementing the above-mentioned three concepts. Susan is well on her way to growing her bottom line ALONG WITH her top line. She also realizes that if she ever wants to sell her company, the sale price will have more to do with profit than revenue. When you avoid bringing up price, when you recognize your value, and when you find impact together, you’ll carve out a niche where customers appreciate value over price. And the next time you think that your customer is focused on price, step back. You might be the one concerned about price. 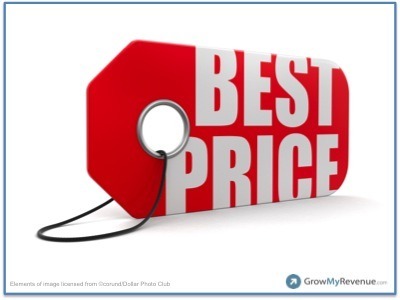 When has a vendor offered you a discount when you would have happily paid a higher price? Take the discussion to Twitter or LinkedIn and share your thoughts.